I’m always on the look out for a diabolical workout. Sometimes I dream them up myself, other times I’ll see one somewhere and give it a try. I’m Shawna K, otherwise known as the ‘Pull Up Queen’. I create and do challenging workouts and I teach my clients to rise to the challenge as well. I must give credit where credit is due, I found a cool workout in Men’s Health. I saw the word ‘pull up’ and I was sold. How could a workout NOT be a great challenge when it included one of my favorite exercises? In fact, 6 minutes of work with my favorite exercise? Before I get to the workout, I figure I’d give you some tips on how to achieve a pull up. After all, it’s one of the most challenging bodyweight exercises out there. You’ll feel empowered when you can knock out reps of the pull up. Your physique will scream that you’re a champion when you can do pull ups. You’ll walk a little taller and get the respect you deserve when you can do pull ups. Are you sold on pull ups yet? In order to get better at pull ups, you actually have to DO pull ups. Sort of a catch 22 don’t you think? How can you DO a pull up when you can barely hold your body weight from a bar? Well, don’t cheat so much as do ‘assisted’ pull ups. That’s an actual training method, not cheating right? 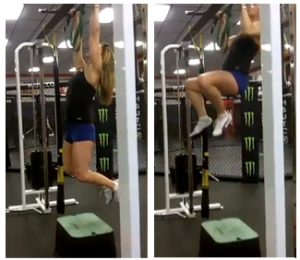 A second option is the jump pull up (you’ll do this for assistance in set two and three for the workout following). Find a bar that’s low enough to jump up to. Use the power of your legs to help with getting UP to the bar and lower yourself slowly. This is a little more advanced, but you can drive your knees and hips forward to provide some swing and momentum in getting UP to the bar and again, slowly lower yourself. You’ve probably noticed the common theme: lower yourself slowly from the bar. 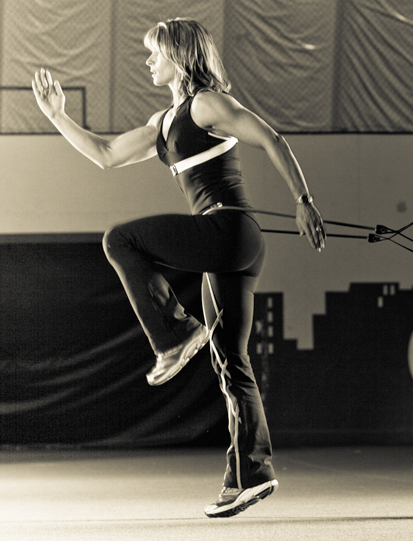 The eccentric contraction or lowering is really the portion of the movement that builds strength. So do whatever you can to get UP to the bar. 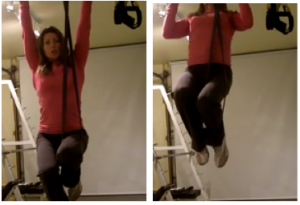 Doing assisted pull ups this way isn’t really ‘cheating’ because you’re not at risk for hurting yourself. I NEVER suggest cheating for any other movement due to the risk of injury. Here there is none. So do a little cheating to help you, then as you get stronger, clean up your reps.
Here’s how the workout goes…by the way, the workout is more of a finisher in that it only lasts 9 minutes. And that includes three whole minutes of rest. Believe me, when I did this workout, I wanted twice that long a rest. MISSION: Perform as many pull ups as you can in 2 minutes. Coaching Tip: Use as strict form as possible, chin over the bar, full hang extension each rep.
MISSION: Perform as many squat-ups as you can in 2 minutes. Coaching Tip: Begin in a full squat position. Explode off of the ground, jumping high enough to grab onto the bar. Use your momentum to pull yourself over the bar and perform a pull-up. Retract and repeat as many times as possible. MISSION: Perform as many burpee-ups as you can in 2 minutes. Coaching Tip: Begin by performing a standard burpee (minus the push up) As soon as you jump to your feet, explode off of the ground and perform a pull-up. Descend back towards the floor and repeat. In the end, I did 70 pull ups in 8 minutes. That’s not bad for a near half centurion. I got 30 pull ups, 23 squat ups and 17 burpee ups. It was closely followed by a near set of ‘throw ups’. Wow, that was tough. If you need more pull up help, give my program a try. It’s got three levels to help you rock the pull up bar. For more tips and tricks to help with YOUR pull ups, check out Challenge Workouts to see if it’s right for you.